All is well out here and the closing distance to Barbados is very exciting - the challenge was put out last night on the radio net to start fishing again today, so we might all have fish for Christmas and make a competition of it. 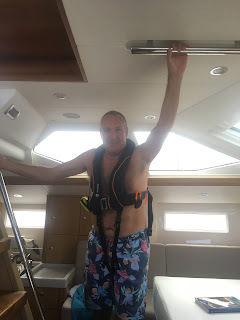 I haven't seen Andrew get the rod out yet though…..
As a treat (400 miles to go celebration) I had tried to make ice for our sundowners yesterday but sadly it didn't work - I think due to the movement. I am thinking one of my jobs for the day is to stock the fridge with arrival drinks….. hmmm champagne and beer perhaps! 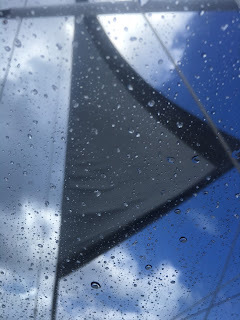 The wind has generally eased, although did pick up for a few hours in the night, we had lots of squalls too, which is normal as the wind eases. This all means the swell is really taking its time to subside, so currently the movement on board is the worst it's been. When the wind and seas are matched Askari sits well but no yacht likes big sea and light wind. Wildlife update - we have not seen any dolphins or whales, we have only had two flying fish on the deck and one hit the dinghy, however yesterday we had what looked like brown things with red tails swimming alongside the boat. We guessed they were cuttlefish or squid; they looked just like fishing lures, about a foot long. We did hear that Golden Breeze, who are 200 miles directly east of us, were followed by orcas for a couple of hours - so we are now on serious look out as that would be just incredible. Today we are listening to a music mix Ellen made for us for our Pacific Crossing 11 years ago - it's still one of favs and makes me feel very happy.